Not everybody can wear the same color, there are flattering colors on one person that doesn’t work for the other and there’s a reason why. We all have different skin, teeth, hair and eye colors, the four basic elements to keep in mind while you wear some colors. If you use the right color, your eyes will sparkle, your skin will glow and your hair will brightened. When you wear the wrong color your face looks older and tired, your under eye circles will stand out and will create shadows on your face. Skin, hair, teeth and eyes react to the color around them, meaning that every person has their own coloring. This depends on the carotene, hemoglobin and melanin of each body that creates your warmth or coolness coloring that should match with the coolness or warmth of the colors you wear. To know if you’re a cool or warm undertone person hold metallic gold and silver fabric near your face. If silver is remarkably better and flattering, your undertones may be cool; if gold is a lot better, your undertones may be warm. Pay careful attention to yellow teeth, under eyes circles, the shadows of your face and to double chin illusion; with your right colors, all of those should disappear. Some people look good with both so it’s easier for them to use a variety of colors. Once you have determined if you’re warm or cold undertone, try some fabrics on top of the gold and silver metallic pieces and see which colors are the best for each one, for sure those will also work for you. 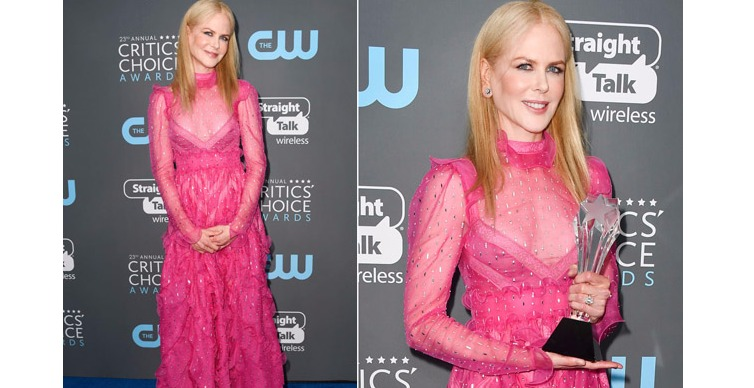 Famous actress Nicole Kidman wearing both metallic gold and silver. Off course she has makeup on but still we can appreciate that she’s a warm undertone person. Her face looks smoother, with nice skin color, the highlights on her hair are stunning and no shadows. On the other hand, silver make her look pale, her hair is not as nice and shadows can be seen on her face. This doesn’t means that she always has to wear gold, it means that she’s a warm undertone person and looks better with warm colors such as brown, rust, cream, olive, camel, etc. Actress Anne Hathaway wearing gold and silver. We can instantly say she’s a cool undertone person. She glows on her silver dress and her face just brighten. In gold she looks pale, you can see the shadows on her face, creates the illusion of under eye circles and she doesn’t seem to be as comfortable as in silver. So Anne Hathaway could wear colors such as burgundy, black, grey, navy, etc. Anne Hathaway in dark blue.